Seeking a missing ingredient to understanding Earth's environmental changes, a new satellite conceived through unique international collaborations was launched today to map the planet's salty seas from space. The Satelite de Aplicaciones Cientificas-D spacecraft blasted off aboard a United Launch Alliance Delta 2 rocket at 7:20 a.m. local (10:20 a.m. EDT; 1420 GMT) from Vandenberg Air Force Base, California. The 12-story rocket escaped the ground-hugging marine layer blanketing the Central Coast, thundering southward to eventually reach a 408-mile-high sun-synchronous orbit and successfully living up to its reputation of dependability. Built by Argentina, the SAC-D satellite is equipped with multiple scientific instruments from several countries including NASA's Aquarius sensor package designed to make exceptionally precise global measurements of salt content at the ocean surface. "Measuring ocean surface salinity from space is NASA's latest technology achievement and it's really going to be a great leap forward for the science of oceanography," said Eric Lindstrom, Aquarius program scientist at NASA Headquarters. "For many of you, salinity is a rather obscure quantity, but I must tell you it's of critical importance in the ocean circulation, in the climate system and in diagnosing the flow of fresh water through our Earth system." Standing 16.4 feet tall and 9 feet wide within the Delta rocket's protective nose cone, the SAC-D spacecraft weighed 2,977 pounds at launch. The two-stage launcher reached a preliminary parking orbit about 11 minutes after liftoff, then coasted around the South Pole and soared towards Africa when the booster performed a final maneuver to inject the satellite into the desired orbit. Deployment of the payload occurred as expected 56-and-a-half minutes into flight. NASA has spent $287 million on the Aquarius project, which includes paying for the satellite's launch. A Delta 2 rocket has never faltered in its 48 missions for the space agency over the past two decades. The large oval antenna reflector and three microwave radiometers at the heart of Aquarius will work like highly sensitive radio receivers to detect variations in the electrical conductivity of seawater, enabling scientists to deduce the ocean salinity levels. "Salinity is the glue that bonds two major components of Earth's complex climate system: ocean circulation and the global water cycle," said Aquarius principal investigator Gary Lagerloef of Earth & Space Research in Seattle. "Aquarius will map global variations in salinity in unprecedented detail, leading to new discoveries that will improve our ability to predict future climate." The satellite will orbit the planet every 98 minutes, covering a swath 242 miles wide for Aquarius to accumulate entire global maps of the planet each week. "Salinity is the amount of salt dissolved in seawater and you might be surprised to know it varies through the ocean," Lindstrom said. "It's measured in grams of salt in kilograms of seawater. It's typical range is from 32 parts per thousand to 38 parts per thousand. These are small numbers, small differences, but they make enormous difference in the circulation and climate." Scientists have collected a few million measurements of ocean salinity over the last hundred years, but vast stretches of the planet have never been sampled. Gaining a complete picture every seven days should revolutionize scientists' knowledge of the oceans by unveiling for the first time how salinity changes across the entire globe month-to-month, season-to-season and year-to-year. "We stand to discover a lot from the Aquarius measurements by having year-round measurements of salinity," said Lindstrom. "The temperature in the winter in the Southern Ocean or in the Greenland Sea is horrible, you don't want to go do that, you'd be much better to get that from space. So I'm all in favor of this. I don't want to spend any more days out in 50-foot waves!" What's more, the accuracy promised by Aquarius is two parts in 10,000, the equivalent of a 1/8th teaspoon of salt into a gallon of water. Aquarius will be able to detect that tiny amount of salinity change. Aquarius and SAC-D join a constellation of other environmental research satellites and ocean observers that study sea temperatures, levels, colors and surface winds. "The addition of Aquarius to this suite of instruments helps create a more complete picture of our oceans and the impact on Earth's climate," said Eric Ianson, Aquarius program executive from NASA Headquarters. 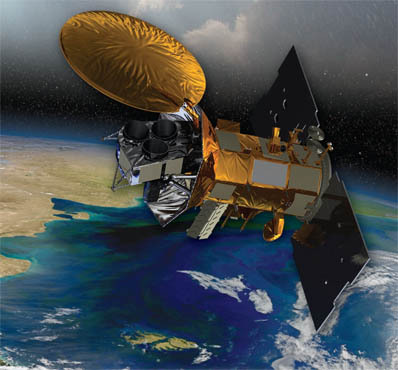 "This important Earth science mission is NASA's first attempt to measure ocean surface salinity from space. Obtaining global measures of salinity is key to our better understanding of ocean circulation, climate and the Earth's water cycle." "A key missing piece that is really in demand by the ocean science community is salinity. Together with surface temperature, salinity determines the density of the surface water of the ocean. Density variations and wind drive the ocean circulation. So this is why we want to get this missing piece. Particularly, the deep waters of the ocean get their properties at the sea surface in winter, so their temperature and salinity are set for their lifetime, they get dense and sink to the bottom of the ocean and fill up the ocean basins," Lindstrom explained. Never before has the U.S. entrusted such a key instrument to fly aboard an Argentinian satellite. But the cooperation between the nations' space agencies -- NASA and CONAE -- has seen American rockets launch the earlier SAC-A on the shuttle Endeavour in 1998, SAC-B on a Pegasus in 1996 and SAC-C on a Delta 2 in 2000. The SAC-D spacecraft, which also carries instruments contributed by Canada, France and Italy, was assembled in Argentina, then shipped to Brazil for pre-flight testing before finally traveling to Vandenberg Air Force Base for launch. The mission is expected to run at least several years to answer fundamental questions about the climate. "Another grand problem in Earth science is to understand the water cycle -- evaporation from the ocean, clouds, rain, formation of ice, runoff from the land back into the sea -- and the ocean salinity really turns out to be a pretty useful diagnostic of the big-picture in the water cycle," said Lindstrom. A 50-year trend of the limited sampling shows that salty places are getting saltier and the freshwater places are getting fresher. "Is this an indication we're having an acceleration of the planet's water cycle? The salty places in the subtropical (areas) are having more evaporation, the rain belts are having more precipitation and the ocean is giving us this signal," said Lindstrom. "This is an indicator but there could be other explanations for this. It could be the ocean circulation is changing, it could be ocean mixing is changing. What we really need to do as oceanographers is dig into this more deeply and Aquarius will help us illuminiate these processes. It's a diagnostic for the water cycle but it can also help us tell about ocean circulation and mixing." Once Aquarius is commissioned and ready for service in about three months, scientists plan a field campaign with ships, buoys, floats and gliders to compare data with the satellite instrument as the mission commences in earnest.